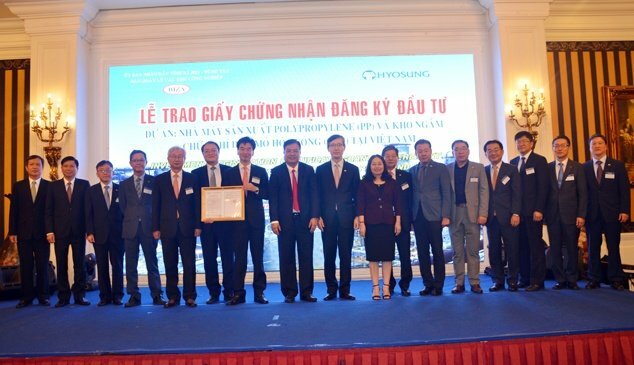 Calling Vietnam a strategic base for its global expansion, South Korea’s Hyosung Group has solidified its presence in the country after it received the investment certificate to build the $1.2 billion complex in the southern province of Ba Ria-Vung Tau yesterday. Covering 60 hectares, the complex will include a propane dehydrogenation (PDH) production plant, polypropylene (PP) plant, liquefied petroleum gas (LPG) storage tank, and LPG and petrochemical product warehouse at Cai Mep Industrial Zone in Ba Ria-Vung Tau located near Ho Chi Minh City. The complex is expected to come into commercial operation in 2020. The group plans to locally produce PP, which is used to manufacture various containers, drain pipes, medical syringes, and textiles in Vietnam in order to improve production efficiency. This is part of its strategy on raising the export competitiveness of its domestic production bases by increasing investment in Vietnam. Hyosung is planning to convert the Yongyeon propylene plant, the capacity of which was increased by 300,000 tonnes last year, into a plant producing PP for pipes, a high-value-added product, and dualise the new propylene plant in Vietnam by producing general products as well in an effort to secure cost competitiveness and profitability, and maximise synergy effects. Ba Ria Vung Tau’s chairman Nguyen Van Trinh granting the investment certificate for Hyosung Group. 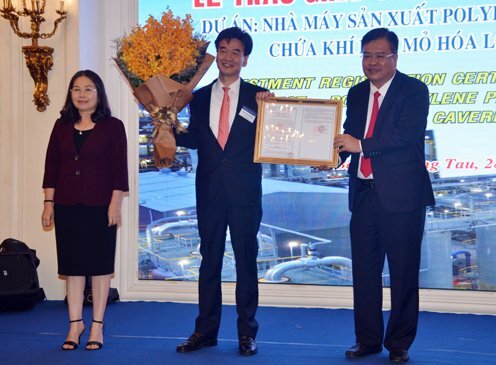 At the investment certificate granting ceremony, Chairman of the Ba Ria-Vung Tau People’s Committee Nguyen Van Truong stressed that the giant complex will play an important role in the country’s and the province’s socioeconomic development. It will also create jobs for about 2,000 workers during its construction as well as contribute 80 million to the state budge per year. In a meeting with Prime Minister Nguyen Xuan Phuc earlier this year, Hyosung chairman Cho Hyun-Joon stated the corporation would utilise Vietnam as a global production base for all of its core products, such as textiles, industrial materials, chemicals, and heavy industry to make inroads into the global market. Since Hyosung established Hyosung Vietnam in the Nhon Trach industrial complex near Ho Chi Minh City in 2007, the company has invested about $1.5 billion so far. Hyosung is the largest Korean investor in the Nhon Trach industrial complex. On a 1,200,000sq.m site, the size of more than 90 soccer fields, it produces its core products, such as spandex, tire cords, steel cords, and motors, and operates with more than 7,000 local employees. Hyosung is also considering constructing an additional production subsidiary in Quang Nam province in Central Vietnam. If this project is completed, Hyosung Vietnam will have attained a production base to produce the products of all its business divisions, targeting the global market both in name and reality. As for motors, Hyosung is planning to make half-finished products in Vietnam, finish them in the Changwon plant in Korea, and export them so that the productivity of domestic plants will be enhanced and exports will be increased as well.